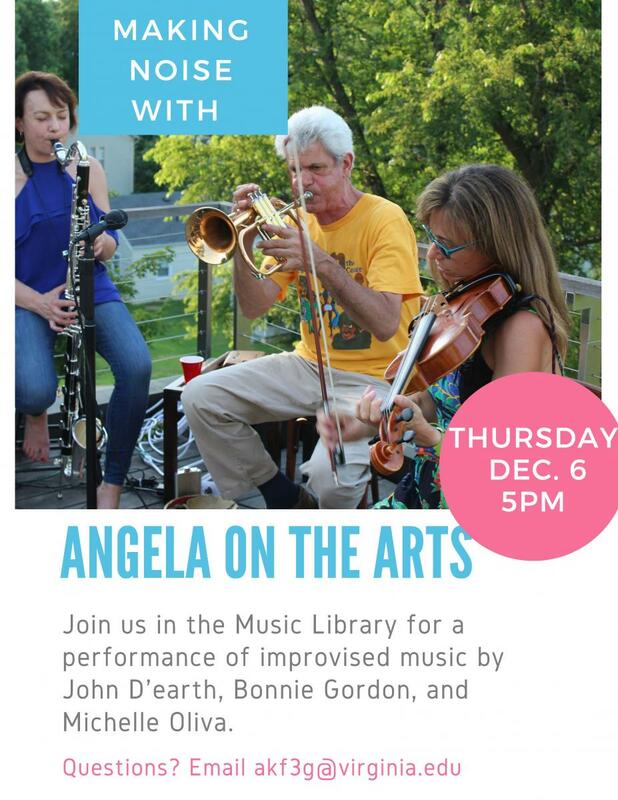 The UVA Music Library Making Noise Series presents Angela On The Arts on Thursday, December 6th 2018 in the Music Library in Old Cabell Hall. Angela On The Arts plays freely improvised music. The band includes John D’earth on Trumpet, flugelhorn and percussion, Bonnie Gordon on viola and Michelle Oliva on Bass clarinet and loops. Their jazz-and-chamber-music-inflected sound vibrates with a sonic archive early jazz, Miles Davis, Eric Dolphy, Ornette Coleman, early modern modal music, Arnold Schoenberg, John Cage, rock & roll, Charles Ives. All three explore improvisation as a musical practice, an intellectual engagement, and a way to move through the world. Improvisation is personal, local, mysterious, ephemeral and co-creative. D’earth and Gordon teach in the Music department and Oliva is currently a visiting scholar at the Institute for Environmental Negotiation. The band looks forward to making noise in the library. As always, the performance is free and open to all and there will be a reception.